Personal contact by phone (if requested) for the initial consultation, and for a follow up if necessary. In our initial conversation we'll discuss your rifle and scope combo, the purpose which you're using the rifle and load for, what components you may already have on hand which could work for you, and a sensible accuracy goal. In a follow up phone conversation (and/or email), we will discuss your targets. We'll interpret the data, and consider seating depth adjustments that may improve your accuracy even more. 1) Electronic scales of low quality will drift from zero during the loading process, especially with a cell phone nearby. Use a quality beam scale, or a proven quality electronic scale. 2) Shooting from wobbly portable shooting tables. Shoot prone off a bipod and solid rear sandbag, or use a concrete or similar permanent shooting bench. Portable tables will double your group size in most cases. 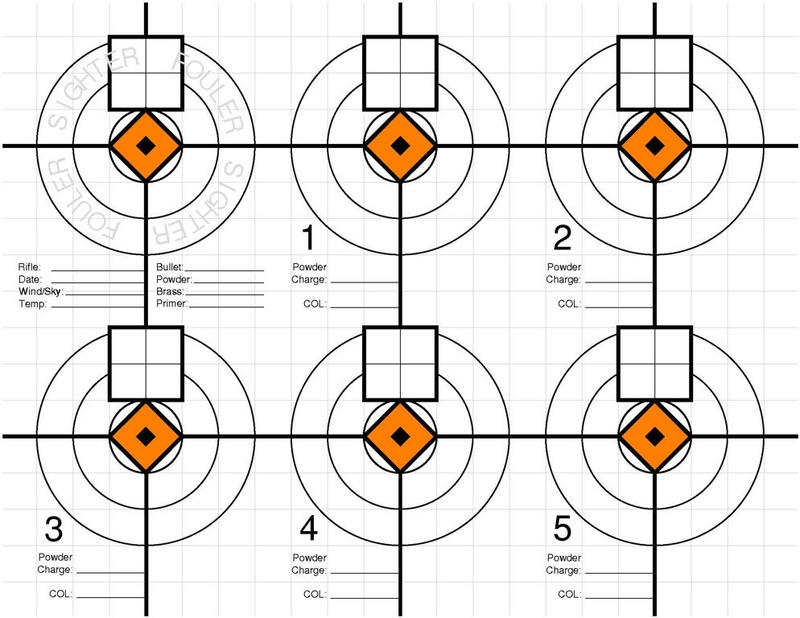 3) Insufficient knowledge of scope parallax adjustment and sight picture, or problems with consistent cheek weld for each shot, proper trigger pull, and recoil control--all of this can conspire to ruin your groups. 4) Shooting a bullet which is seating depth sensitive is rarely a good idea. Companies which have historically produced seating depth sensitive bullets have by now lost enough market share that they're making better bullets which are less prone to being damaged at inopportune seating depths. 5) The client should realize that groups which exceed 2 MOA at 100 yards are *not* caused by the load recipe which is using a quality, well designed bullet. Even the worst 100 yard "scatter node" groups should not exceed 1.5 MOA in an accurate rifle which is being properly handled. 6) Light neck tension from bushing dies with less than .003" of neck tension rarely outperform Full Length sized brass in the same recipe. --> RE-READ the above seven points! !